Based on reviews from 36,165 users. 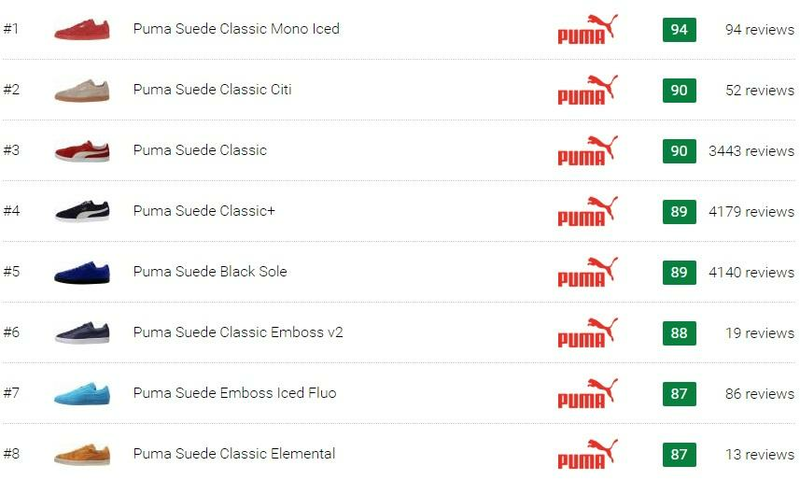 Learn how our rankings work or see our guide to Puma Suede sneakers. Updated Apr 2019. When it comes to iconic footwear, one of the models that sneaker lovers favor is the Puma Suede. The classic shoe has led to many versions, collaborations, and redesigns throughout the years. Today, the sneaker continues to be hailed as a casual staple by men and women. It has held a significant role in the b-boy and hip-hop communities, while its start in the basketball court is well-documented. Puma is also known to be innovative with the colorways that have been featured on Puma Suede sneakers. The kicks come in innumerable colors that fans can choose from to suit their tastes. Colorways such as High Risk Red, Peacoat, Bluebird, Vintage Khaki, and many other distinctly named options have been sought-after by casual wearers. Here, one could know more about the legendary Puma Suede sneakers, how they came to be, what their popular colors, models, and collaborative editions are, and much more. Puma Suede sneakers have been well-loved since their release in 1968. As a result, there are many models and editions in the collection, from classic variations to collaborative releases. 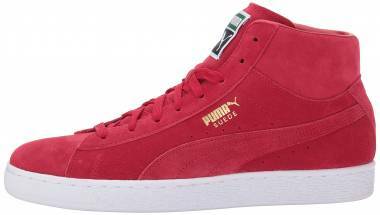 Below are some of the shoes that are considered as the best Puma Suede shoes. There are also some quick facts about the colorways, price range, and the fit and sizing of Puma Suede sneakers. This model started it all way back in 1968. The Puma Suede Classic broke convention by not using leather or canvas for its upper. Suede was used instead, a durable and better-looking material that offered superb performance for athletes and casual wearers alike. There have been many colorway variations released for this sneaker over the years, each one providing a classic appeal. For 2018, fresh colorways were introduced to fit modern street style, including Black/Firecracker/White, Elephant Skin/Team Gold, Forest Night/Puma Team Gold, Iron Gate/Buckthorn Brown/White, and Laurel Worth/Forest Night/White. This shoe retails at the budget-friendly price of $65. The model is said to run true to size, with good support. It’s available in men’s 4-14 and women’s 5.5-12 in medium width. This model differs from the original in one respect: it has a leather Formstrip along with its suede upper, offering a sleek look for the classic shoe. There are also perforations on the shoe’s midfoot area. It comes with two lace options to change up the look.The slimmed down Suede Classic is a fan favorite without a doubt. It has many colorway options, including Amazon/Black/White, Black/Bluebird, Burnt Olive, Dark Shadow/Black, Limestone Gray/Peacoat, Steel Grey, High Risk Red/White, and Blue Olympian/White. It was released at a $65 price point, making it budget-friendly. Sizes for both men and women are offered in medium width, from 7-14 for men and 5-11 for women. The Citi version of Puma Suede sneakers is so named because this is the Suede that inspiration from city life. As such, the shoe is offered in metropolitan colors, providing a vibrant outlook for any day. This shoe features a smooth streetwise swagger, showcasing the classic silhouette with an updated modern touch, reminiscent of 1990s hip-hop style. Its color selections include Vintage Khaki and Black Coffee. It comes at a budget-friendly price. Sizes are in men’s 4-14 in medium width, fitting true to size but a bit narrow. The Easter edition of Puma Suede shoes levels up the shoe with soft colors that can often be seen during the Easter season festivities. This model is done in pastel colors for a distinctly youthful vibe. It has a monochrome and candy-colored approach that’s appropriate for Easter celebrations. The midsole also has a soft-colored, eggshell-like design in an opaque rubber material that will give an edge to any outfit. Its beautiful colorways include Halogen Blue, Aruba Blue, and Prism Pink, which are perfect for the summer and spring seasons. It’s set at a budget-friendly $80 price tag. Men’s 6-16 and women’s 5.5-12 sizes are available for the shoe. This model gives a unique take by making the Formstrip at its lateral sides embossed, instead of stitched-in using suede or leather material, giving it an added stylish detail. The Embossed Suede Classic model is light and easy on the foot. The sneaker is available in warm tones and neutral colorways, featuring a monochromatic upper that’s complemented by the plain white sole. It was released at a budget-friendly price of $70. It runs true to size in medium width, offered in men’s sizes from 6-14 and in women’s 4-11. Featuring a mid-collar height, the Puma Suede Classic Mid offers a heightened chic style for the classic silhouette. The Puma Formstrip is made in Terry Cloth for a unique take. There are perforated details on the shoe’s midfoot. Its color options include Blue Depths, Black, and Toreador. It’s set at a budget-friendly cost of $70. Men’s sizes from 5-15 in medium width are available for this model. It runs true to size but has been described to have a narrow fit. Going a half size up may be necessary. Sleek and modern is the Mono Iced edition of the Puma Suede Classic could be described. It retains the classic’s sporty vibe and easy-to-wear flair, ideal for those who are always on the move. Its upper comes in monochrome colors sitting on top of an iced sole. There are many colorways for this shoe, including Fair Aqua, Blue Coral, and Sulphur Spring. 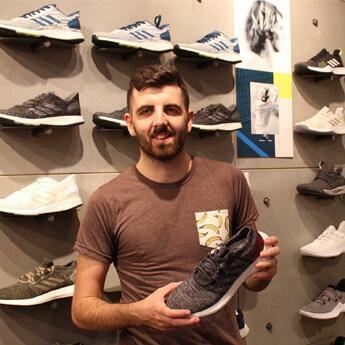 Users were attracted to this sneaker’s affordable price. Women's and men's sizes are offered. For men, the sizes are from 4-14, while for women it's from 5-12. It's true to size, but those who have wide feet may have to go at least a half size up. Just like the Mono Iced, the Mono Ref Iced version of Puma Suede shoes comes in a one-color upper with an iced rubber outsole. Revamping the silhouette of Puma Suede sneakers, this version features a smooth and modern appeal. Its colorways include High Risk Red, Bay, and Orchid Bloom. It’s offered at a budget-friendly price tag. Women’s sizes are available from 5.5-12. It’s in medium width and is reputed to have a small sizing, so a half size or one size up may be ideal. This model was released in 2017 and featured a water-resistant upper and a gum outsole. Music artist Big Sean promoted this edition of Puma Suede shoes as part of the brand’s marketing drive. The color options for this version are Falcon, Birch, Black, and Sailor Blue. Its price point is considered to be affordable. With a true-to-size fit, the shoe is offered in men’s sizes from 4-13 in medium width. Puma paid tribute to the City that Never Sleeps in the Puma Suede Classic NYC. New York is where some of the biggest fans of the Puma Suede sneakers are found. They are stylish people who are known for their unique yet elegant taste, which is what the brand was going for in this edition. It has a lace clip embossed with the Puma name. Available in Vibrant Orange, this shoe was inspired by the city's colorful, neon-infused streets at night. It was released in men’s sizes, from 7-13 in medium width, fitting according to size. Another geographical tribute, the Puma Suede Classic Paris honors the City of Light. Paris is also considered as the fashion capital of the world, so it was only apt for Puma to pay the city a special compliment in the form of its very own version of Puma Suede sneakers. It has a tricolor lace-up closure, in red, blue, and white, in honor of the flag of France. It has a lace clip debossed with the year 1968, designating the release of the original Puma Suede shoes. This edition was released in a vibrant Electric Blue Lemonade colorway. It was issued in men’s sizes, ranging from 8-12 in medium width. Puma celebrated the Suede’s 50th-anniversary by introducing 50 different versions of the shoe over one year. One of the special editions is the Puma Suede Classic Rudolf Dassler, dedicated to the brand’s founder himself. The Puma Suede sneakers’ label is done in gold on the upper. Vintage branding comes in the form of the old Puma logo, which was used from 1948-1951. It features the Leaping Cat going through a large D, signifying the Dassler name. This shoe comes in only one colorway: Black. Like many of the Suede Classics, this edition is budget-friendly. It’s offered in men’s 6-16. Part of the Puma Suede 50 series, the Puma Suede Classic Seoul is another take on the timeless silhouette, using a geographic twist. It blends street style with the unique DNA of Seoul. The fashion-forward city and longtime lover of the Suede was appropriately honored. There is a lace clip at the bottom of the lace-up closure that’s embossed with the Puma name. The shoe features 50th-anniversary branding, including a special commemorative box and a matching t-shirt with each purchase. It comes in one special colorway: Nimbus Cloud. Its price is an affordable $95. Men’s sizes from 7-13 are offered. Proving that it’s not afraid to experiment, Puma combined the timeless silhouette of Puma Suede sneakers with a contemporary shoe design: knit sock construction. The suede upper is extended with a sock-like material, along with a ribbed collar, making the high-top shoe look eye-catching. Three colorways were released for this edition, which are Olive Night, Black, and Birch. Men’s sizes in medium width were issued, ranging from 4-15. Rounding off the Puma Suede Classic collection is the Classic+ model, which comes in fresh colors that will suit one’s sporty and stylish outfits. The sneaker has a special rubber outsole that offers optimal grip. Peacoat and Forest Night are the color options issued for this model. At $65, this shoe is budget-friendly. It’s available in men’s 4-11.5 in medium width. Puma set out to win the hearts of women everywhere with an edgy platform sneaker, the Puma Suede Platform. It offers a sporty alternative to the platform styles in women’s footwear, providing a raised sole for added height without the discomfort. This model comes in a few color options, featuring a monochrome approach. It’s an affordable option from the brand. Women’s sizes are available, from 5.5-11 in medium width. Singer Rihanna's Fenty Creeper inspired the Puma Suede Platform Core, yet this model is made to be more accessible regarding the price tag. It had a similar look to the artist's hyped-up sneaker, with a platform sole and updated with metallic gold and silver accents for extra polish. Several colorways were released, including Oatmeal, Barbados Cherry, and Peacoat. It comes at an affordable cost. This shoe is said to offer excellent toe space for those who have average to wide feet. Women's sizes from 4-12 are provided. The women's only silhouette of the Puma Suede Platform gets another update in the Crushed Gem variation, which has an eye-catching and sparkly gem-encrusted toe. Luxury is what comes to mind. Meanwhile, all the trademark comforts of Puma Suede shoes are retained. This shoe was released in Marshmallow/Metallic Gold, Black, and Black/Aged Silver colorways. It’s set at an affordable price. Women’s sizes ranging from 5.5-11.5 are offered. Another platform offer from Puma, the Suede Platform Trace offers such head-turning details as a layered midsole, elevated rubber sole, and trademark suede upper. The chunky-looking sneaker is another Rihanna inspired model, its design takings its cue from the singer’s Puma Fenty Creeper. Some of the unique color combinations of this model are Olive Night, Rock Ridge/Marshmallow, Peach Beige/Pearl, and Aquifer/Blue Flower. This shoe was released in women’s sizes from 5-11. Rounding off the Suede Platform series from Puma is the Suede Platform Trace Bold shoe. It’s constructed with a premium grippy sole that’s meant for walking the streets in style. This time, the sneaker showcases a bold touch with its eye-catching color combinations. The shoe is done in bold colorways with a straightforward design. Scarab/Lemon and Evening Blue/Scarab are the two color options for the model. It comes in women’s 5-11. The price is set at a reasonable amount. Aside from the Puma Suede Classic and Puma Suede Platform series, the two most prolific lines that utilize the classic Suede silhouette, there are plenty of other Puma Suede sneakers that will suit individual tastes. Below are some of the select models that could be worthy of consideration. Puma goes patriotic with the Puma Suede Americana, an exclusive edition sneaker that takes part in the Fourth of July festivities. This model was released on June 24, 2016, just in time for the Independence Day celebrations on the 4th of July. A stylish contrast is added by the white Formstrip, along with a grey detail on the sides. Completing the look is the lace-up closure, which is done in a starry design. The sneaker is designed with a blue upper scattered with white stars, along with red accents on the heel and tongue label. It was released with a budget-friendly price of $75. This low-top shoe was issued in men’s sizes, ranging from 7-13. The rich suede upper of Puma Suede shoes received an extra stylish upgrade in the Puma Suede Bow. It features a fancy satin bow on the heel, instantly transforming the classic shoe into a modern feminine silhouette that looks as gorgeous as it feels. The same practical features of the original model are featured underneath this shoe’s striking bow. This shoe comes in several unique color options, including Island Paradise, Shell Pink, Elephant Skin/Silver Cloud, and Black/Iron Gate. It comes in women’s 5.5-11. A criss-cross pattern on the upper of the Puma Suede Breaker distinguishes it from the other models in the line. The subtle yet exceptional design gives the shoe a fresh and edgy vibe, while at the same time retaining its elegant appeal. Its slightly raised midsole gives it a chunky flair that adds a fun accent to the sneaker. Red Dahlia, Pebble, and Black are the color options for this model. Men’s 7-14 are offered for the sneaker’s sizes. The 1980s makes a comeback in the smooth silhouette of the Puma Suede Deco, which is done in soft and bold color options that will make for a pleasant street style. It can be easily paired with other retro-inspired clothing, creating funky looks for any day. With a price point of $75, the shoe is budget-friendly. It’s issued in men’s sizes, from 7-14. An extra-large ribbon lace-up elevates the Puma Suede Heart Bubble to sophistication. The prominent ribbon secures the fit of the sneaker while adding an elegant touch to the athletic silhouette of Puma Suede shoes. It's a real marriage of a sporty vibe and a graceful style, perfect for women who are as refined as they are always on the mover. Pearl and Black are the two colorways available for the shoe. At $80, this model is budget-friendly. Women’s sizes are offered from 5.5-11. Sports, fashion, and lifestyle all come together in the Puma Suede Heart Reset, a shoe that features long velvet strings for the lace-up closure, which ends in a cute bow. The arresting look makes for a fun style that would be exciting to mix and match with different clothes. There is a second set of woven box laces that could be used to create a more subdued look. Aruba Blue, Soft Fluo Yellow, and Prism Pink are the shoe’s colorways. It’s sold at a budget-friendly price. Women’s 5.5-11 are offered for the sneaker. This Italian-model showcases a textured toe and tongue for an added refined and edgy approach while staying true to what made Puma Suede sneakers iconic. Its long, clean lines and narrow tooling all pay tribute to the original model, updating the look with its elaborate detailing. Birch/Puma Team Gold is the name of the sneaker’s colorway. This shoe offers value for the money at its $120 price. It’s offered in women’s 5.5-11. A paint splatter design is found all over the Puma Suede Paint Splat, making it a genuine work of modern art that is as versatile as it is unique. The trendy look could add a stylish accent to any outfit while being subtle enough for mixing and matching various clothes. It had a 2015 release and was inspired by American painter Jackson Pollock's distinct expressionist technique. This model is available in the Hawaiian Surf/Gold colorway. It’s a reasonably priced shoe. Men’s 7-13 are offered for the sneaker. Reminiscing the good old high school days gets more fun with a pair of the Puma Suede Varsity. Its sports-inspired look is further emphasized with the gold-edged Formstrip, along with its soft and neutral colorways. It was released in Cerulean, Ribbon Red, and Black color selections. It has a budget-friendly price tag of $70. Women can choose their sizes for this sneaker, ranging from 5.5-11. Puma Suede sneakers have become so popular since their release that there have been multiple editions over the years. Not only that, as the sneaker has also been redesigned and revamped by various creative individuals and brands. For the 50th anniversary of Puma Suede shoes, the brand partnered with top creatives from fashion, the music industry, pop culture, and the streets. The collaborations were all part of the Puma Suede 50 collection. Apart from that, Puma had also partnered with other creative individuals over the years. Read on below to know more about the most noteworthy collaborations for Puma Suede sneakers. Canadian singer-songwriter and produced The Weeknd partnered with Puma to release the Puma x XO collection. XO is the name of the singer’s record label. The collection is a combination of street-influenced styles, taken from the aesthetic of the famous singer. One of the shoes from the series is the Puma Suede Classic x The Weeknd. The military-inspired sneaker is made of the brand’s signature premium suede upper. It has adjustable and interlocking straps around the shaft of the shoe, creating a unique and modern look for the model. There are also buckle closures on the straps for an added edgy vibe. This shoe is available in Glacier Gray and Black. It has a slightly expensive at $140. Unisex sizes are offered for the sneaker, from 4 men/5.5 women up to men’s 13/14.5 women. Rapper Big Sean made a name for himself from the streets of Detroit. His unrelenting passion led to him becoming an international icon, not just in the music industry but also when it comes to his style. For his second collaboration with Puma, Big Sean turned to one of the brand’s undeniable classics: Puma Suede sneakers. His Puma Suede sneakers have a progressive design upgrade, along with premium materials and street-ready styles. His signature detailing and Detroit branding adds a touch of exclusivity to each model. For this partnership, three distinct shoes were released. Puma x Big Sean Suede Sneakers. Available in soft two soft colorways, Melon and Ash, this $100 sneaker set itself apart from other models with its understated approach. It was released in men’s sizes, from 7-14. Puma x Big Sean Suede Mid Sneakers. Just like the low-top Puma Suede sneakers in Big Sean’s collection, his Mid version comes in a soft yet vibrant colorway: a mint-colored Jelly Bean. It was issued at the reasonable price of $110 and comes in men’s 7-14. Puma x Big Sean “Black White” Sneakers. Big Sean kept things simple with this trusty sneaker, available in a Black/Whisper White colorway, which retailed at $110. This men’s shoe has available sizes from 7-13 and could also be worn by women by going 1.5 sizes down. Pop superstar Rihanna joined Puma as global ambassador in 2015. She initially focused on the Women’s Training division, later joining the company as Puma Women’s creative director. Her Fenty line has since been internationally successful, with many other fashionistas and celebrities wearing the kicks. Rihanna’s fashion goddess status became evident when she showcased her eye for combining the classic with the fashion-forward. One of the signer’s first projects involved creating fresh new looks for Puma Suede shoes. The trendsetter widely retained the rich suede upper construction, yet updated the look with an elevated sole. It enabled women to make a fashion statement without having to sacrifice comfort, thus leading to the shoes’ global acclaim. Puma x Rihanna Suede Creeper. Rihanna's fashion influence had women clamoring for a pair of this sneaker, which featured a platform gum sole and simple color options. It was issued in women's 5.5-11 sizes and men's 8-14 at a slightly expensive price point of $150. Puma Fenty Suede Cleated Creeper. This shoe was released in Black and Golden Brown colorways and is similar to Rihanna’s Suede Creeper, but with a cleated rubber structure and a thicker gum sole. It was sold at a slightly expensive price tag in men's 7-14 sizes and women's 4-11. Dutch designer and illustrator Caroll Lynn, also known as Careaux, has partnered with Puma since 2016. She created unique designs for the brand’s classic kicks, such as the Puma Suede sneakers. 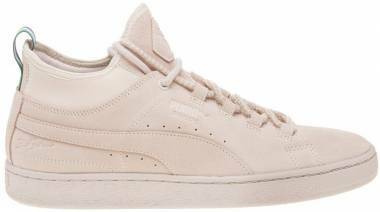 The Puma Suede x Careaux has a touch of elegance due to its feminine accents. Its floral design, metallic details, and speckled midsole showcase the designer’s signature artistry. The shoe was released in women's 4-10 and men's 6-15. It is said to be best suitable for narrow to medium feet. It comes at a budget-friendly price tag. In 1968, Rudolf Dassler and his team at Puma decided to create a sports shoe that could be used for any athletic activity. It was set to be a shoe that would break barriers between different kicks meant for various sports. At its early stages, it was called the Crack. The combination was simple: a molded rubber sole that supported a soft suede upper. It underwent more design changes and was then renamed. Released as Puma Suede sneakers, it didn’t take long for trendsetters to start wearing the shoes in sports courts, arenas, and on the streets. The year they were released, Puma Suede sneakers bore witness to an important historical occurrence. African-American athletes Tommie Smith and John Carlos had won the gold and bronze medals in the 200m run, respectively, in the 1968 Olympic Games in Mexico. After receiving their medals and standing at the podium to hear the U.S. National Anthem, the two sportsmen raised their black-gloved fists in silent protest of the plight of African-Americans back home and the sports industry. The event would be known as “the 1968 Olympics Black Power Salute.” Both athletes had their Puma Suede sneakers beside them on the podium as they chose to stand in their socks. In 1973, the sneaker was released as the Clyde, named after legendary player Walt “Clyde” Frazier, who was known for his stylish and cool approach that has a distinct rebellious edge. It became the first ever signature sneaker in the annals of the NBA, another historic moment for Puma Suede shoes. In just one year, two million pairs of the sneakers were sold. In signature Walt Frazier style, the print ads for his shoe showed him wearing a fur coat and top hat, cradling a ball while posing with a wild animal, the shoe superimposed in front of him. It was also in the 1970s that breakdancing started to emerge and the B-Boy culture was born. Dancers looked for a sneaker that could give them the right support and durability, as well as a cool factor, to perform their best. Puma Suede sneakers became the shoe of choice due to its flexible upper and thick rubber soles, enabling the model to bear witness to the emergence of a whole new genre. By the 1990s and 2000s, Puma Suede sneakers had become the favorite sneaker of creative individuals in different fields. Street artists, punk rockers, and more embraced the freedom that the model gave them, solidifying the cultural significance and stylish value of Puma Suede sneakers. How does one choose outfits to pair with Puma Suede sneakers? There are many ways to style Puma Suede sneakers. It has a sports-inspired silhouette that makes it suitable for wearing with athleisure apparel. On the other hand, its subtle and smooth design also makes it appropriate for pairing with casual outfits for any day. The following are some more ideas on how to choose clothes to go with Puma Suede sneakers. For a night out in the city, a simple outfit involving a V-neck shirt and jeans or a dress complete with a pair of Puma Suede sneakers will make one look polished. When hanging out with friends, Puma Suede sneakers can be paired with a laidback ensemble consisting of a t-shirt and a pair of shorts or jeans. Some people wear their Puma Suede shoes all day, even while at the gym. Leggings, tracksuits or pants along with a moisture-wicking t-shirt should match the model's sporty chic appeal. Are there any technologies used on Puma Suede shoes? Puma Suede sneakers lack the technologies that Puma has poured into its sports shoes. However, the models in the Suede collection are still known for having premium materials and innovative features that have made them comfortable over the years. They have foam footbeds that provide support and cushioning. Their suede uppers are known to have a luxurious feel. How durable are Puma Suede footwear? The upper materials of Puma Suede sneakers are known for being able to withstand wear and tear. They also have rubber soles that can endure extended wearing. These are among the reasons why the model has continued to be popular. However, since they are geared for casual use and lack added technological features, extra care is needed to let Puma Suede shoes last much longer. What is the style of Puma Suede sneakers? Puma Suede sneakers have a sports-inspired design, especially since they started out as performance shoes that were previously used for running and basketball. However, their design is known for being smooth and simple, as opposed to chunky athletic shoes. This is why the kicks have done well in the lifestyle footwear category. This is also why the model is considered to be very versatile. Are Puma Suede casual shoes comfortable? From the beginning, Puma Suede sneakers were lauded for the comfort they provided. Their suede uppers felt softer and less restricting than the leather material that was popular back in the day. At the same time, the suede structure also offered more support than canvas. The footbeds are also cushioned. As a result, the shoes have been known for their comfort. How does one keep Puma Suede shoes clean? Puma recommends using a specialized suede brush to clean the outer surface of Puma Suede sneakers. Longtime wearers also have some advice when it comes to cleaning the kicks. For light buildups on the upper of Puma Suede shoes, unscented baby wipes have been found to be useful. For getting rid of sticky stains, a cloth dipped in warm water has been suggested. Suede cleaning fluid sprayed on damp cloth could also be used for wiping away dirt on Puma Suede sneakers. Air-drying is recommended to dry out the shoes, followed by a suede brush. Are there any celebrities who are fans of Puma Suede collection? Puma Suede sneakers have been around for so long and were able to stay trendy over the years that many popular figures have been drawn to the model. Singer and brand collaborator Rihanna has been known for being a fan even before joining Puma. Other music artists such as Jay-Z, Madonna, Tyga, Chris Brown, and Will.I.Am have been seen out and about with a pair of their Puma Suede sneakers. Puma Suede sneakers are also known to be model-approved, with such supermodels as Cara Delevingne, Alessandra Ambrosio, Hailey Baldwin, and Joan Smalls were seen walking around during off-duty days while wearing the kicks. Actors Zac Efron, Ashton Kutcher, and Jack Black, along with reality star Kylie Jenner, are likewise known to be fans of Puma Suede sneakers, among many others.